Illustrations by Jill Zielinski Designs. I have a new pattern coming out soon! 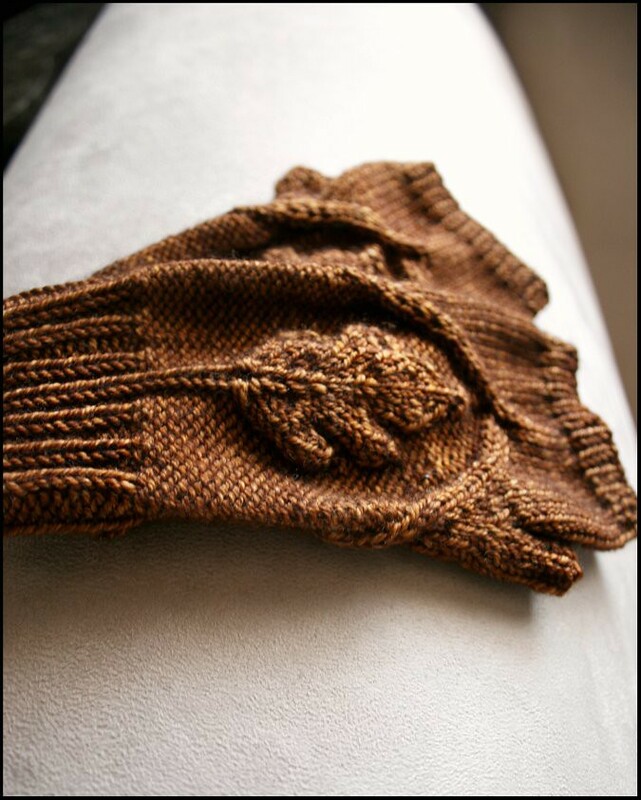 It's a pair of fingerless mitts called Oak Grove and I am very excited about them! I will be posting all of the pattern information within the week. For now.. here is a sneak peek! and Becoming Art Cielo Sport in Sunlit Amber. Recently I've had the pleasure of working with these 3 gorgeous yarns. There is nothing more inspiring as a knitter than working with good materials in colors that you love. As I work on my newest design projects, I cant stop thinking of all of the new patterns I want to create. 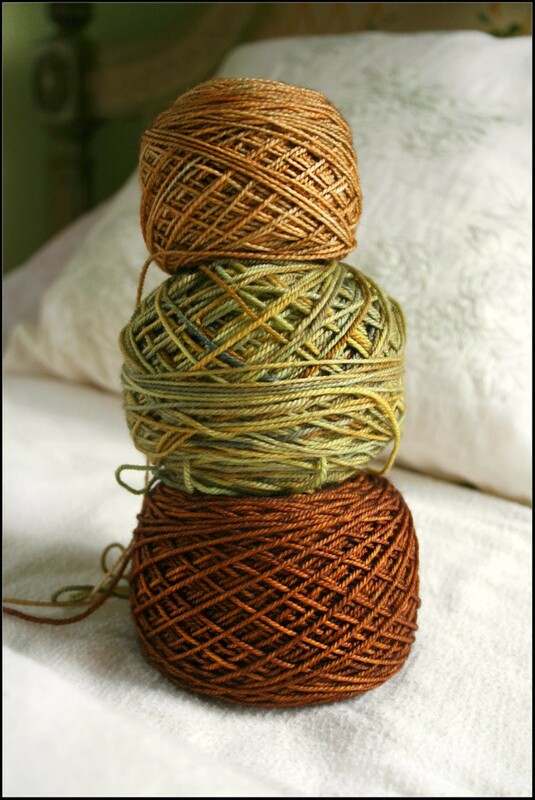 All I want to do these days is knit and knit and knit... and buy more beautiful yarns of course! 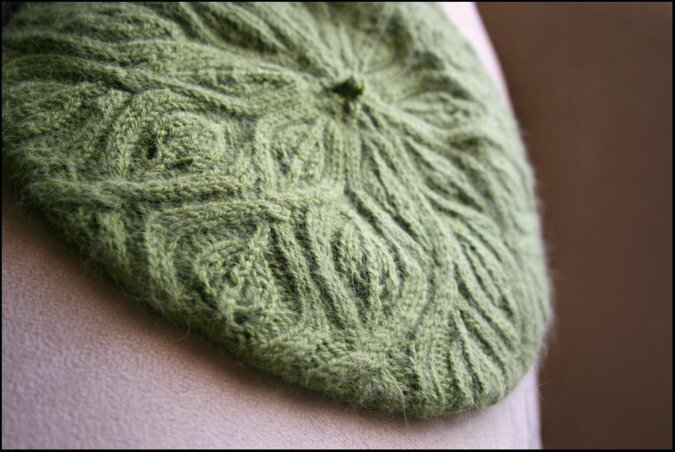 Both the slipper and sweater pattern are perfect projects for the Cascade 220 yarn. Please check out my latest podcast episode to learn more about Cascade 220 and to hear a funny knitting story provided by Melynda Bernardi of French Press Knits. Also, check out Sandrasingh.com for discounted rates on Cascade 220. 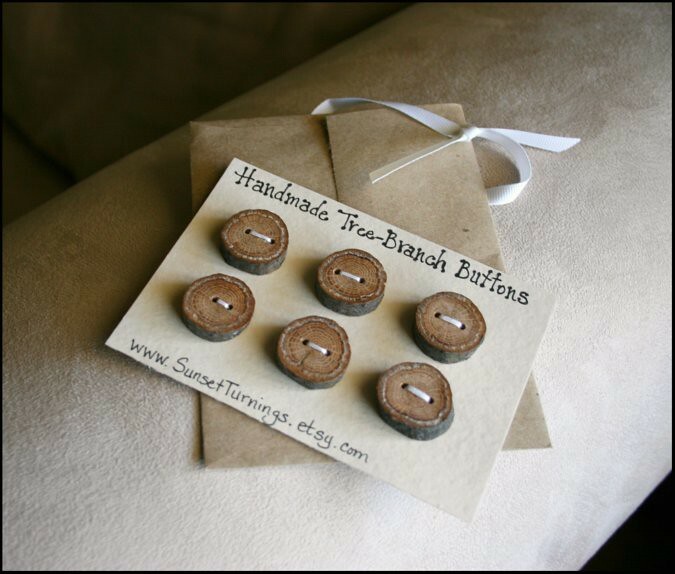 She has also provided a special free shipping code to the NNK readers and listeners for all orders over $50. Enter the code "NNKFree01" at checkout. To enter this giveaway, please leave a comment telling me how you feel about Cascade 220 yarn. Have you used it in the past? Do you have a favorite colorway? Only one comment per person please, and don't forget to leave your contact information so that I can easily get a hold of you if you are the winner! Have fun! 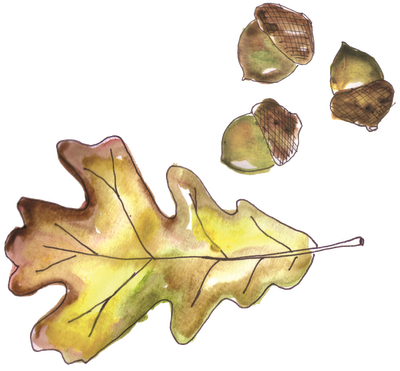 The winner of Episode 45's Knitterella Drawing Giveaway is Maria! Congratulations! *Please check back soon to enter the drawing for Episode 46! 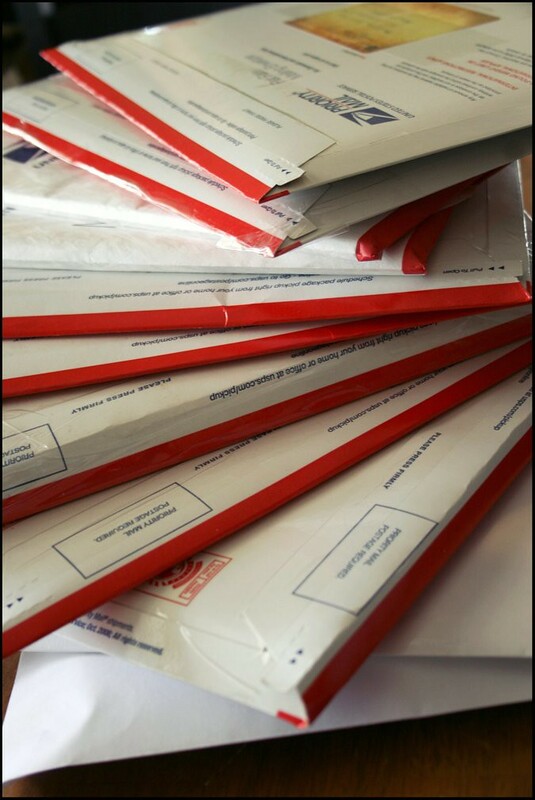 Get free US shipping (a $6.99 value) on orders of $50 or more from sandrasingh.com until January 15th! Enter code "NNKFree01" in the checkout process. Click HERE to download the Episode 46 MP3 file. Over a year ago now, I designed this little sweater for Spud and Chloe. I'm so happy to see that it has finally been published! 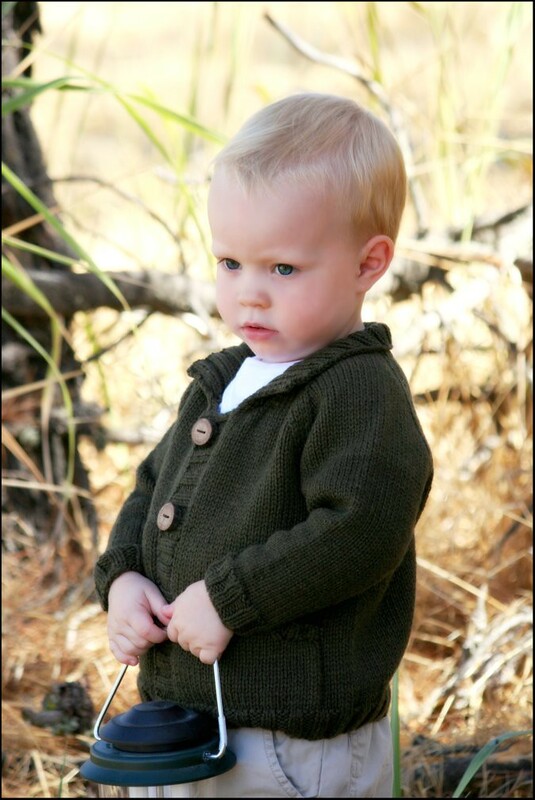 This sweater is available in children's sizes 1-12 which is so great. It is fun for me to see it modeled by an older child because the version that I turned in was a tiny size 2. Here is my original sweater. I named it the Campfire Jacket. My friend's little boy, Benjamin, modeled it for me. Isn't he so sweet? 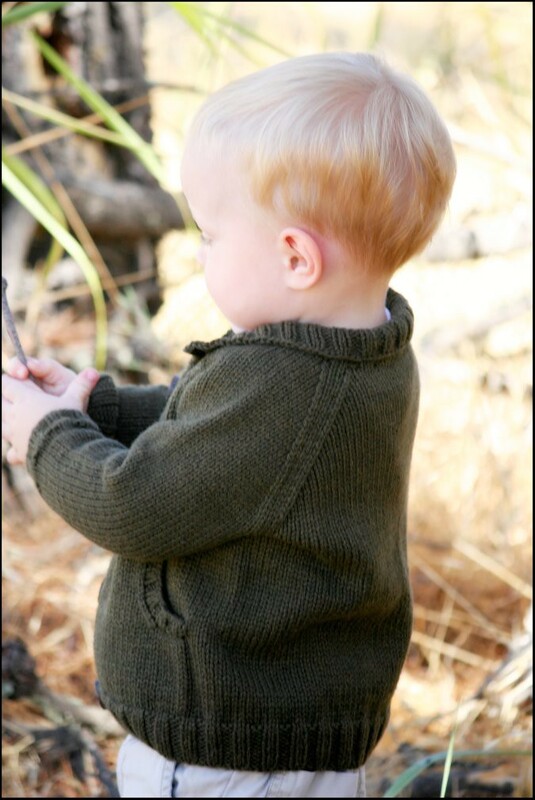 This is a great little cardigan because, like all of my other children's patterns, it is knit in one piece! Even the pockets are knitted in. Its unisex, cozy and warm. 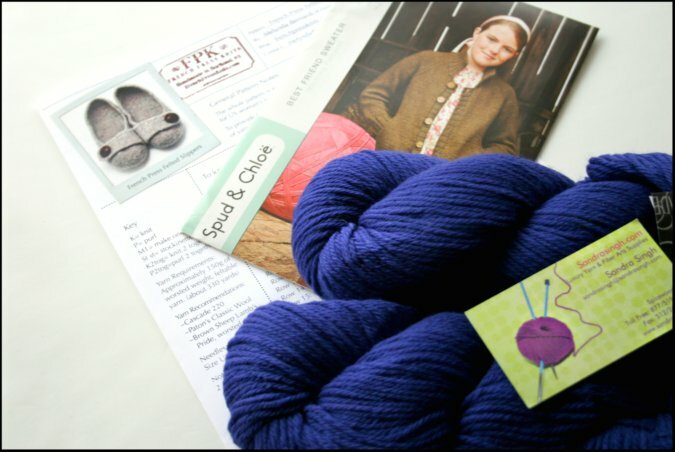 And of course you know how much I love the Spud and Chloe Sweater yarn! It's a perfect choice for children's garments. The color that this sweater is knitted in is called "Chipmunk". I've never seen a dark green chipmunk myself... (except for this one) but anyways.. this colorway is what inspired the campfire theme. I found these amazing handmade tree branch buttons on Etsy, and I think that they really made the sweater extra special. All of the pattern information can be found HERE on the Spud and Chloe website. 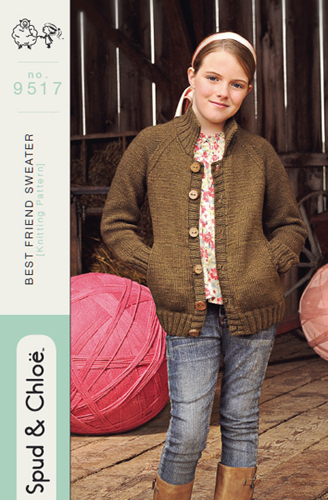 All of the Spud and Chloe patterns can be purchased through your local yarn shop. I feel so privileged to have had the opportunity to design for such an awesome company. I hope you enjoy this knit! 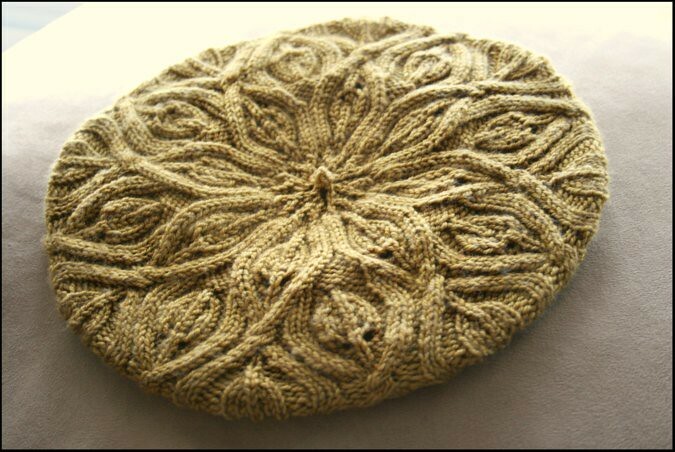 I've just received all of the Autumn Vines Beret samples back from my test knitters. which is an excellent substitute yarn for this pattern. The hats used approx half of the yarn. 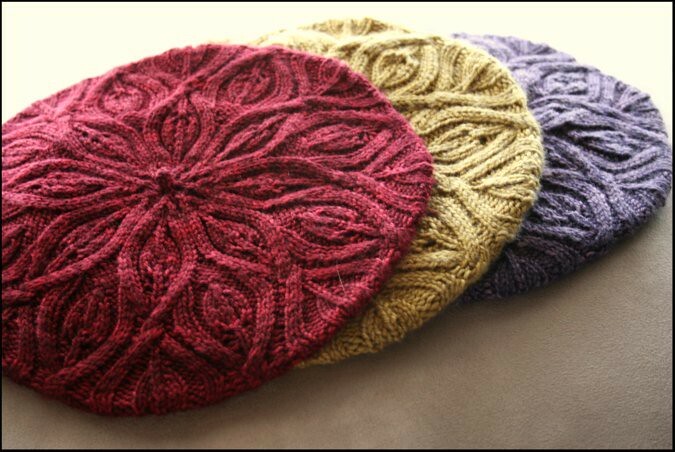 I think that you could definitely make 2 hats from one skein. 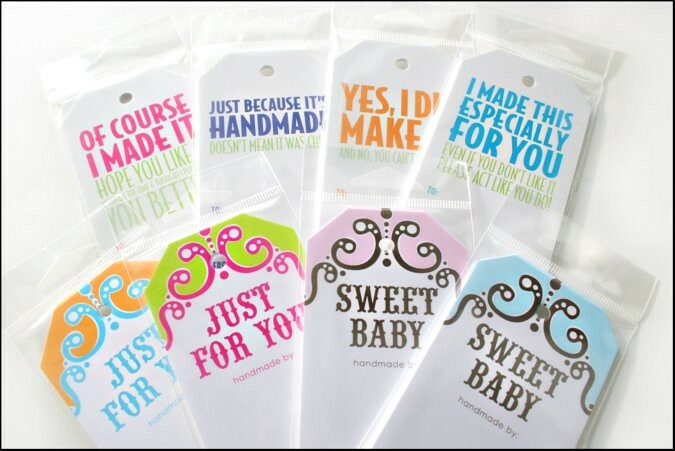 All of these samples were sent off in this month's trunk show displays. 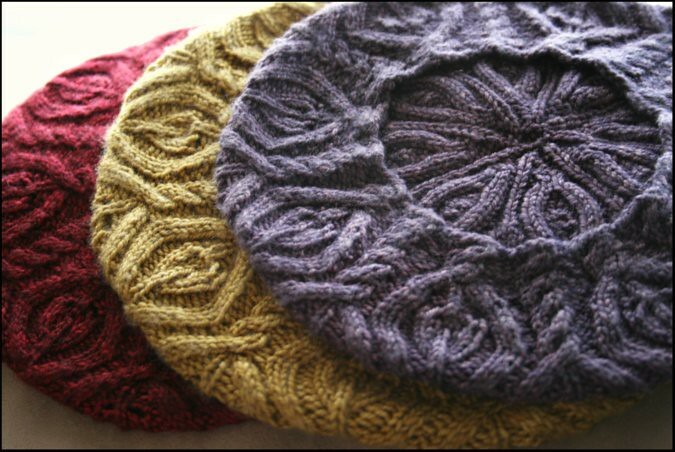 Check the schedule to see if any of these hats will be appearing at a yarn shop near you. although I probably shouldn't wear it in a hat. It would perfectly blend in with my blond hair and look really strange, I'm sure. I am dreaming of a sweater in this color though. That would be so pretty. That delicate gold has really got me hooked. Thank you again to Yaena, CeRae, and Andrea for test knitting for me! You did a wonderful job! 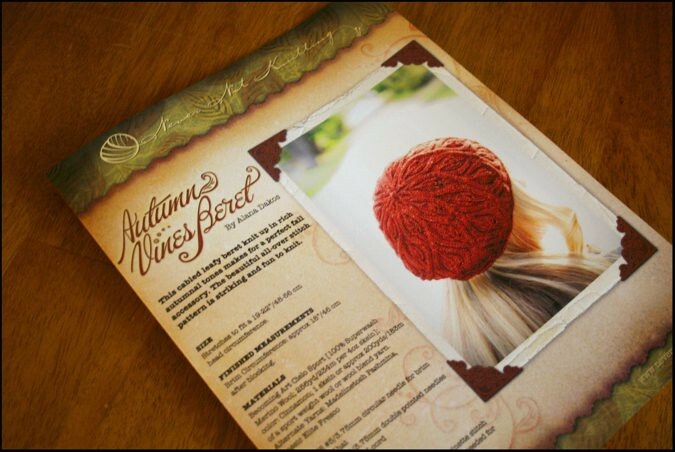 Just the other day I received in my bulk shipment of Autumn Vines Beret patterns from the printery! I love the way they have turned out! The past few days have been completely taken up with pattern order processing and packaging. Check for the printed pattern in a yarn shop near you! 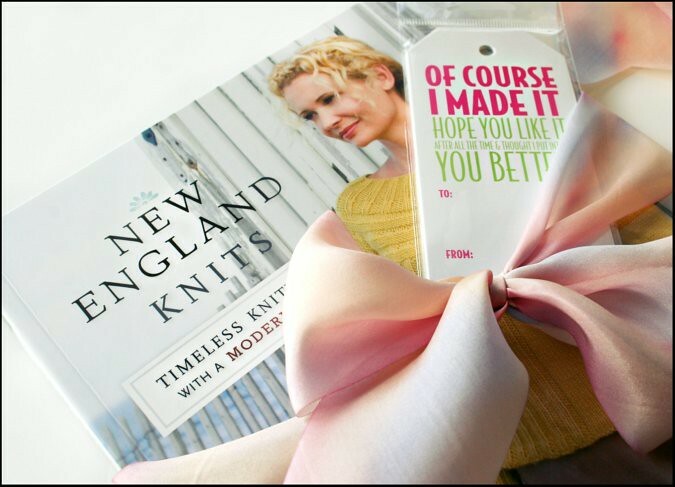 The winner of Episode 44's Brave New Knits Drawing Giveaway is Judi A! Congratulations! *Please check back soon to enter the drawing for Episode 45! Get free shipping on all Knitterella purchases through the month of December! Just mention Never Not Knitting in the checkout process and Jill will refund you your shipping charges. Click HERE to download the Episode 45 MP3 file.